Okay if you already read Sandra Dodd’s Just Add Light And Stir Posts then I am sorry for the repeats but I just can’t help myself, so much wonderful information. Today’s quote linked to a page written by Pam Sorooshian, whose 3 radical unschooled children are now grown. You can find more of her writing, as well as one of her daughters, at the Always Learning Yahoo group, Sandra Dodd’s website (Sandradodd.com), or her blog Learning Happens (seriously I could fill a whole page with Pam’s credentials). Everything that I try to write here when asked about radical unschooling revolves around this quote by Pam. You can read more of Pam’s Principles Of Unschooling here. I have witnessed “real learning” through my children, myself, and my husband. This is why I know radical unschooling works. This is why I myself am so confident. I wasn’t always, I too had fears that I needed to overcome but I needed to face those fears for us to get where we are now. What I write here I learned from others who have gone before me, from real radical unschoolers who not only walk the walk but whose children are now grown and adults themselves. To me in my opinion they have proven radical unschooling works, to me if you are seriously interested in learning about radical unschooling they are “the” experts and there is no better place to learn. I also know reading about it and actually trusting it works and doing it are two different things. Reading is easy, it’s safe. It’s “sure I believe it could work” but being afraid to take the plunge. “How did you let go?” “How did you get over the hump?” I took the plunge! I “read a little” from those experts who went before me, and I “tried a little” of what they mentioned, then I “waited a while” to see if they were right (which they were 🙂 ) and “watched”. I watched and saw what “real learning” looked like. This did not happen overnight. In fact my “deschooling” lasted a year. I blogged about it. Looking back at those posts I laugh but I know it was a process that could not be skipped and very much-needed to happen in order to get where we are now. I also know I am still learning and will continue to do so before our journey ends. I love unschooling! I love writing about our learning adventures and I love talking about it with those who are interested but something I learned along the way is in order for one to do it *you* need to do it. There is no magic answer or guide to follow on how to do it, only the wonderful advice from those who know what worked and what didn’t and what I could add to that comes nowhere close than discovering them for yourself. If you want to know what real learning looks like this is a great place to start. Yes it is tea time once again for this mama. Tea time is time I have set aside for myself to do “a little reading”. I want to mention that tea time for me is *not* “me time”. As a unschooling parent I never know when I may get time to myself. See usually I am helping someone find glue or spelling out a word or helping work a puzzle or playing a game, okay you get the point. So when a time comes that everyone is off doing their own thing (it does happen the older they get 🙂 ) I decide to make myself a nice cup of herbal tea and catch up on my reading. I know most of these links can be found pretty easily and may even be repeating to some readers but I like to share pages or videos that I come across that really help guide me to be a more mindful parent or helped me gain confidence toward unschooling. The reason I started researching radical unschooling in the first place was because even though we had been homeschooling for a while and even though when we first started out everything was great, as the girls started to get older things started to change. Miss Sky became more vocal about her likes and dislikes and Little Sis just didn’t fit the bill for Waldorf education at all. If I had stayed on that path against both of the girls wills I would probably be knee-deep in preteen rebellion and Little Sis would just *now* be learning her ABCs. Yes I am SO glad to have found radical unschooling, it was hard enough for me to write that let alone think of everything the girls would not have learned. It is one thing if a child truly is not ready to learn to read yet, Miss Sky was a later learner that is why Waldorf education was perfect for her in the beginning. However to hold someone back on purpose in my opinion is a real disservice to the child. It does not allow them to be who they were born to be. There is no whip cracking here, no one forcing someone to learn their ABCs or how to add (even though you can not force anyone to learn anything anyway). Everyone in this household learns because they *choose* to. As the girls started to change so did I. Instead of being the girls partner in life, like I always wanted to be from the very beginning before they were even born, I became their adversary. The older they got the more I had to control, so I had thought. The more I had to control the more they wanted to rebel and the more they wanted to rebel the more I yelled and punished. It really is an awful cycle. I didn’t like the b**ch (it really is true) I had become. That is when I read something that changed everything. I realized I *chose* to be a b**ch. No one made me but me. I also realized I could choose not to be one anymore. In order for this to work every time I got ready to yell I made a choice that took me closer to the parent I wanted to become. Instead of yelling I walked into the bedroom and took a deep breath. While in there I thought about what it was I was SO upset about. Spilled milk? Was it an accident? I will say it was *always* over something stupid. Even if it was a broken window, the window was broken and I still needed to replace it whether I yell or not. Yelling does not solve the problem. Once I had a clear picture of what I really was upset over, like not having the money to replace a window, instead of yelling I became honest. Once I became honest the girls let their guard down and wanted to help come up with a solution. The more choices I made toward being the girls partner the closer I came to being the parent I always wanted. It has been almost 2 years now since I have yelled at my kids. It saddens me to even think that I did at one time. Becoming a more mindful parent is a choice. It is your choice whether or not you want to change. The above quote came from here. Once I changed my “have to” to choose to my path became a lot clearer. The girls have been given the gift of choice now. They realize now that everything they do is their choice. This is why unschoolers have a much better experience in school or college, they are not there against their will but instead because they choose to be. I have always been one of those parents who allowed the girls to eat all the candy they wanted Halloween night and they have never ate so much where they got sick. In fact last year Miss Sky used some of her candy for experiments. Speaking of experiments, I love the experiment over at the blog Unbounded Ocean. 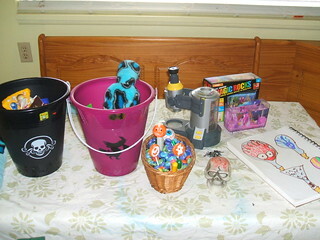 You can read more about how other unschoolers handle Halloween candy here. Wishing everyone a safe, yet fun night. Yep, time for “reading a little” or again in this case watching a little. 🙂 This video was shared in our local unschooling group and I wanted to share it here. He is an unschooled/homeschooled kid who experimented with going to high school. This is one of his video logs. So grap a cuppa tea and enjoy.